7 matt-chromed chrome vanadium steel ratchet spanners. Set of spanners ranging from 8 mm to 19 mm. Ratchet spanners are handy if you need to undo or tighten nuts and hexagon head screws and bolts. A good quality set of ratchet spanners is essential for a tradesman and a handy tool for any DIY enthusiast to keep in their tool box. The spanners are open at one end while the other end has an enclosed ring head. The ring head has a 72-tooth reversible ratchet mechanism. This saves you having to renew your grip on the spanner as you work, making work in tight spaces much easier. The ring head has 12 points which makes it easier to grip the head of a nut or bolt. 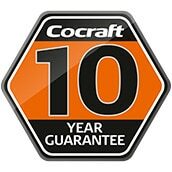 This set of Cocraft ratchet spanners is made of high quality chrome-plated chrome vanadium steel which makes them very durable. The head is offset 15 degrees from the shaft which is great for working in confined spaces and for good grip. Both the ring end and the open end have the same dimensions, 8–19 mm. The spanner set comes in a practical holder.